Link: Will Larry King be the new ‘Daily Show’ Senior Senior correspondent? I received this wonderful review of ‘Daily Show’ writer Kevin Bleyer at the Boca Raton Literary Festival this week from Zoner Kelsey D. She wrote, “As a 15-year-old, not a lot of my friends really watch the ‘Daily Show’ or the ‘Colbert Report’, and I’m a huge fan of both Jon and Stephen, so I really like seeing what other people have to say about their shows on your site. I was thrilled when I saw that Kevin Bleyer, a write for the Daily Show, was coming to my hometown of Boca Raton to give a talk.” She was kind enough to do this write-up for all of us – thank you so much, Kelsey! 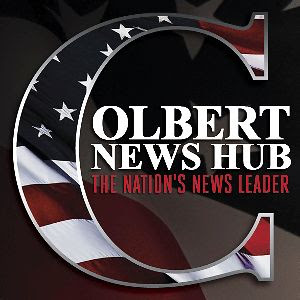 Fun Fact: ColbertNation.com also got almost twice as many total visits as the official site for “Conan” (TeamCoco.com). Did you know that the ‘Daily Show’ has a franchise in the Netherlands? Neither did we, until we saw this video of TDS:N host Jan Jaap van der Wal interviewing Jon Stewart at the TDS:TOS studios. You can check out more about the new show at the The Daily Show (Nederlandse Editie) official site. Who knew Stephen had a side job as a personal shopper? And I’d love to see the Egg Store and Milk Store. And if Jon doesn’t think you can get eggs, milk and pants at the same store, he’s obviously never been to a Super Wal-Mart or Super Target. Then again, Jon does live in Manhattan.